Is it the same as counseling or therapy? How will you ensure the quality of the coaching? How will you choose the right coach? What if my leader or employee (coachee) doesn’t like their coach? What areas are covered in coaching? How does it work for the person receiving coaching? Do you have a list of clients? What is corporate coaching ? Coaching is a collaborative relationship that provides employees with feedback, guidance, and insights from an outside vantage point. 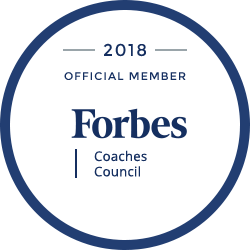 Professional business coaches provide an ongoing partnership designed to help your leaders and key employees produce fulfilling results in their personal and professional lives. Professional coaches are trained to listen, to observe, and to customize their approach to each person’s needs. A coach will advise, guide, encourage and provide structure with positive accountability. The coach will help the client clarify their goals and reach them more quickly than by themselves. A coach challenges your leaders to go beyond their self-imposed limitations, examine their assumptions and existing paradigms, and ultimately realize their full potential. Coaches simply ask their clients to do more than they would have done by themselves. Coaching is NOT THERAPY or COUNSELING! Coaches are careful to maintain a clear and clean distinction between their coaching and therapy. Coaches focus with their client on life and work issues from the perspective of “where are you now” and “where do you want to go”. Therapists, on the other hand, delve into clinical analysis, generally from a historical point of view, and focus on diagnosis and treatment. Many therapists may use some coaching techniques and vernacular, but coaches may not cross the line into therapy — a licensed and regulated profession. If a coach observes the appearance of a mental health issue, he or she will be equipped with referrals to an appropriate psychotherapist or mental health agency. Many companies offer confidential Employee Assistance Plans that are perfect for just this kind of referral. First, our coaches are carefully screened when they apply to be a TurnKey Professional Coach, and they met or exceeded our high standards for qualifications and demonstration of excellence in the field of business coaching. For our corporate clients, we select coaches who have had significant business experience. Then, our proprietary matching process matches clients with the most appropriate, qualified coach. And, lastly, our pro-active quality assurance process throughout the engagement includes regular requests for company and coachee (employee being coached) feedback. This provides an effortless way for coachees to express their level of satisfaction without the risk of hurting the coach’s feelings. All feedback is immediately evaluated, and appropriate action is taken to guarantee your company’s and your employee’s satisfaction. TurnKey Coaching Solutions selects the most appropriate, highly qualified coach for each coachee using our custom-developed, proprietary matching process that ensures quality assurance, client satisfaction, and engagement success. First, we spend time at the initiation of every engagement to thoroughly understand your objectives for the coaching assignment. Next, we customize our “welcome interview” in light of this information and distribute it to each leader or employee included in the program. Based on the information collected, we select coaches that best match the skills and preferences indicated. Our coaches represent the highest level of experience and expertise in the coaching profession. All our coaches are either certified by one of the internationally recognized certifying bodies, have impressive credentials and relevant experience, or have completed an approved coach training and business mastery instruction. Any specific requests or needs will be accommodated to the greatest extent possible. You won’t be disappointed—we guarantee it! If the coachee is not completely satisfied (and happy) with their coach, they simply contact the program manager for re-assignment. It will be important for us to know why they are dissatisfied, both for our quality control purposes and in order to ensure a better fit with another coach. Some of the key areas people choose to work on are: leadership, interpersonal effectiveness, communication, career development, organizational issues, time management, meeting revenue or performance objectives, burn-out prevention (work/life balance), innovation, turn-over reduction, “executive presence”, and managing resistance to change. Coaching can close the gap between where your leaders are now and where you want them to be. Your company’s specific results will vary. However, coaching is a proven performance improvement tool. In fact, we encourage our coaches to work with each coachee to set measurable goals so that the coaching efforts can be validated. Of course, this is often easier said than done. We have developed several coaching packages that are extremely affordable and an investment that makes smart financial sense! We offer different levels of participation which allow you to choose the program that is the best fit for your priorities and goals. All packages include a set number of months of individual, one-on-one coaching, combined with your choice of additional professional development options such as integrated training, multi-media eLearning modules, group coaching, collaborative project facilitation, assessments, 360’s and more. Give us a call to explore which option may work best for you and your company. Our coaching program starts with a “welcome interview” form that is completed by the person being coached. When the right coach is selected, the coachee will receive his or her coach’s contact information and instructions on how to make their first appointment. After their first appointment, they will work directly with their coach to schedule subsequent coaching sessions that are convenient for both parties. We use a sophisticated, on-line console for scheduling and for sharing information between the coach and the coachee that makes the process robust, easy, interactive, and highly accessible for both parties. The coaching sessions are generally conducted over the phone. In a circumstance where the parties are located in the same city, arrangements may be made to meet face-to-face. Some additional coaching can also take place via email messages. Our commitment is to make the coaching experience as convenient, stress-free, and productive as possible. Our executive team has coached for the following corporations (to name a few), and our coaches have coached for hundreds more. Upon contract agreement, we launch into our 4-step process that makes your actions and participation streamlined and easy to implement. 1. Discuss Objectives and Critical Success Factors: Our Project Manager will need to thoroughly understand your objectives for the program and discuss “what success looks like” as part of the initiation process. During this meeting, you’ll want to communicate any assessments, tools, or other resources that may be used in the process. 2. Communicate with Employees: Provide employees names and contact information to TurnKey. We will have the employees complete a Welcome Interview Form which is used to match your employee with the most appropriate coach. 3. Coach assignment: Based on the responses to the Interview Form, the right coach is matched with each employee. The selected TurnKey Professional Coach then contacts the employee to arrange an introductory “chemistry and fit” initial meeting. If there is a good fit, the coach and the employee (coachee) arrange their first actual coaching session. 4. We deliver coaching. You see an almost instantaneous, positive morale impact and performance improvement.